· Enjoy a complimentary copy of the beautifully illustrated classic, Winnie-the-Pooh by A. A. Milne. 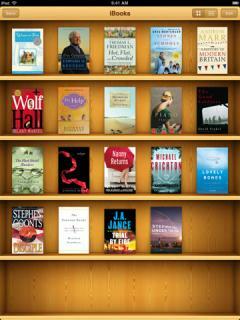 · Download many of your favorite books from the included iBookstore. · Read a free sample of any book on the iBookstore before making it a part of your collection. · Reorder your books on your bookshelf or browse them in a list sorted by title, author, or category. · Easily adjust your screen brightness to find the perfect lighting for any environment. · Change the font size and pick from six included type faces to make your books more comfortable to read. · Find a word, character, or phrase anywhere in your book with the built-in search feature. · Keep your bookmarks, notes, and your current page wirelessly in sync between iPhone, iPad, and iPod touch with the new automatic bookmark syncing feature. · Quickly find a specific page using the page navigator at the bottom of every page. · Read your books on white or sepia colored pages. · Choose left or fully justified text layout from Settings. · Highlight your favorite passages and add notes with the built-in bookmarking features. 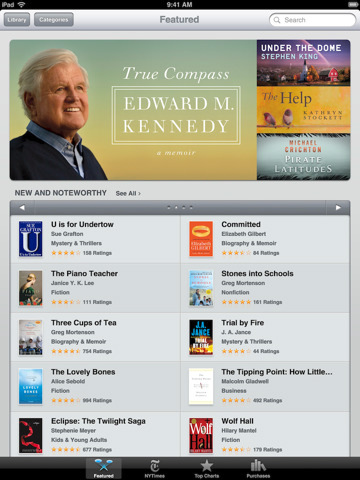 · Add books in the industry-standard ePub electronic book format to iTunes and sync them to iPhone, iPad, or iPod touch. · Add PDF documents to iBooks from Mail, or add them to iTunes and sync them to iPhone, iPad, or iPod touch. · Use iBooks with the amazing accessibility features in iPhone, iPad, and iPod touch – such as speaking the words on a given page. · Experience fully illustrated books, from children's picture books to beautifully designed art books, available for download in the iBookstore. · Organize your books and PDFs into personal Collections. Swipe left or right to jump between Collections. · Print PDF documents and notes you've written in iBooks using AirPrint.